Shortly after the cabin attendants distributed the menus and Bose noise canceling headphones, they came back to set your table and take your welcome drink and meal order. Although JAL has a very extensive drink menu, it didn't take me long to decide. In fact, I decided long before my flight! 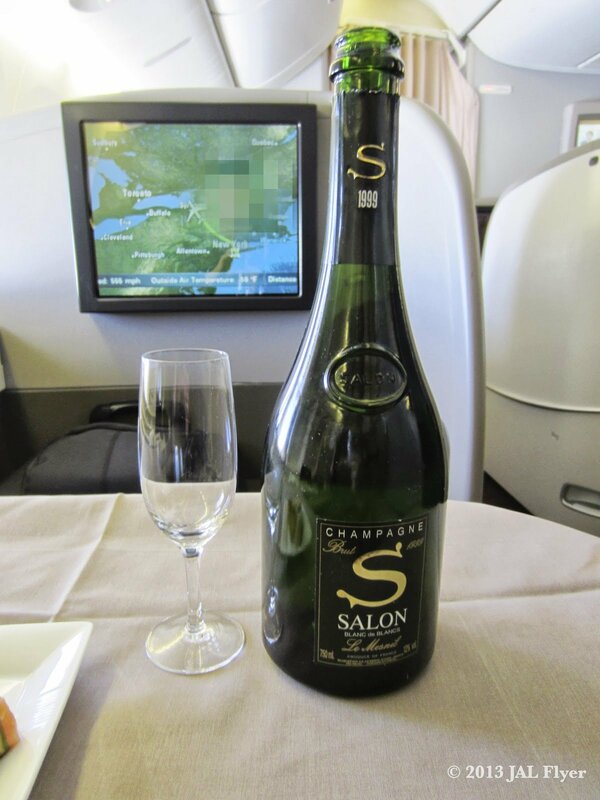 Of course I am going to start the service with the Japan Airlines (JAL) exclusive, Champagne SALON 1999! JAL senior cabin attendant pouring Champagne SALON 1999. After serving the champagne, she offered to take a picture of me and the food too! This is one of many things I like about JAL. The cabin attendants (and ground staffs too) are very proactive. Most of the time, when the cabin attendants saw me taking pictures, they would asked if I would want a picture of me taken. This even applies when I flew in Economy Class! This type of proactive and attentive service continued throughout the flight. Starter served with a glass of Champagne SALON 1999. Starter consists of smoked salmon, cheese sandwich and fried cheese. JAL also offers a wide variety of snacks with the welcome drink including the ones available in other classes. Other than the bit-size starters, the cabin attendant also brought out a basket full of Japanese snacks for us to enjoy. It has something like a dried shrimp head, dried natto, etc. But I am saving my appetite for other food. So I only took the usual - rice crackers served in all classes and the Business Class snack, which is Cracker & Almond for this month. Shortly after I finished my starters, the attentive cabin attendant came to clear the table, refill the champagne, and set my table for the remaining meal service. In the upper left hand corner is the empty dish for fresh bread. A glass of water is also provided for you to cleanse your palate. A famed artisan French butter, from the milk of cows of the small village of Poitiers and La Rochelle. Known as one of the best butters in France, Echire butter is served in the finest dining establishments (which is why the French covet this butter and keep 85% of the production within France). This sophisticated butter won AOC protected status, and is produced mostly by hand. This bar of Beurre Echire has a light texture, and subtle flavor make this butter just about divine. We will substitute similar or comparable items if the butter is unavailable. Silverwares are wrapped inside a napkin with a ribbon on it. Inside, you can find a butter knife, 2 sets of fork and knife for the appetizer and main dish, and a spoon for dessert. These are custom made JAL silverwares with JAL logos on it. These silverwares had once brought some good press for JAL. Back in the days with financial troubles, JAL had figured out an innovative way to save on fuel by reducing the size of these silverwares by a faction of a centimeter. This is something not noticeable by passengers and won't affect quality of service but will translate to substantiate annual saving. To read other parts of this "Sampling oneworld Premium Services Trip Report", you can find the complete index from the Introduction post. There's also a Trip Report Index page which contains indices to all of my trip reports. One of the most detailed posts of a TR I've ever seen. And I'm pretty sure I had Echire butter at L'atelier de Joel Robouchon, it was so good!